Now available in Italiano! Grazie playsoft! In order to use the “Report Settings” (admin) page then you’ll need to add a new table to your database and then fill it with initial data, make sure and change the table prefix (ost_) if you are not using the default. Average time to initial response. Check your path and permissions for reports_csv directory. I set all report_xxx folder to 0777 and working, but ,missing the 3D graph any idea? I have noticed the time stamps on my tickets are an hour behind. I am in the Eastern Standard Time Zone. When I select the Eastern Standard Time zone it places my tickets on Central Time. My Server is located in Central Time. 2. I went into the Preferred Timezone: and set it to Atlantic Time. The time shows correctly in preferences, but on the ticket it is an hour behind. When you setup a new ticket Any suggestions. I also have tried the Daylight saving check box as well. “Enough baby talk…please address the issue or you will hear from me again.”. A ticket, #391320 assigned to you or in your department is seriously overdue. We should all work hard to guarantee that all tickets are being addressed in a timely manner. Enough baby talk…please address the issue or you will hear from me again. Pretty sure that comes with the default osTicket install. Should be somewhere in the email templates settings. I have checked the default email templates and I don’t see it there. Any other suggestions? I’ve checked the SQL databases as well. I am sure it is something I have over looked. My donation is on the way. A little $$ helps to say Merry Christmas. I encourage all out there if you like the software and it helps you out please donate. Scott is always answering questions and development is time consuming. Ooops.. I am addressing this in the wrong forum. Fixed and boy am I blind. Thanks for the help!!! I just found “Enough baby talk” inside the ticket_overdue_body field of ost_email_template. If you check the default template again and look in the body section of the ticket overdue area you should find it. Hi scott this is very useful mod. I have question for you . Can you so me how to create detail message for the report ? Is there a way to change the graph from pie to chart? One thing I noticed after turning on the PHP display errors. I briefly looked into the code and it must have something to do with the fact that there’s already data send in the reports.php file before the session start() function is called in main.inc.php, but I have no clue how to solve this. Do you have suggestion? I can open a ticket for year 2012 and see if that takes away the error, but I just started using it this year, so I would rather prefer a software solution for this problem. Any ideas for this issue? We are new users to OS Ticket. This mod is terrific. We have added it while in pre-deployment status and works well. Thanks! Excellent !!! yesterday I implemented this MOD and work it fine. you have to change permission of “reports_csv” folder to 777 .
can anyone help me to do this reports configuration. Hi is a great MOD I used in 1.6, but now I want to use 1.7 so work in 1.7? I really like what you are doing here. I have the same issue that others have seen. I am Using IIS/PHP/MySQL. If you or anyone else has any suggestions, I would greatly appreciate it. I needed to give IUSER on the local machine write-access to the reports_csv directory. so anyone can help to solve this?? You need to make sure that you installed the reports mod to the default location and that the permissions are correct. 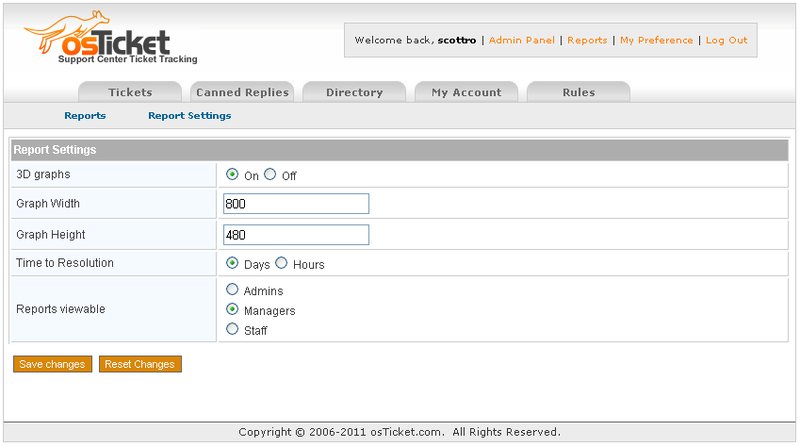 I installed this reporting feature and have an issue with the avg time tickets remain open and average response time. It is not showing the stats in those sections, has anyone run into this? Steve, thank you very much for the report module. I implemented it 6 months and the system is really fantastic. Recently, I configured the e-mail piping so that whenever a customer drops an e-mail, a ticket should be created automatically. It was done successfully. 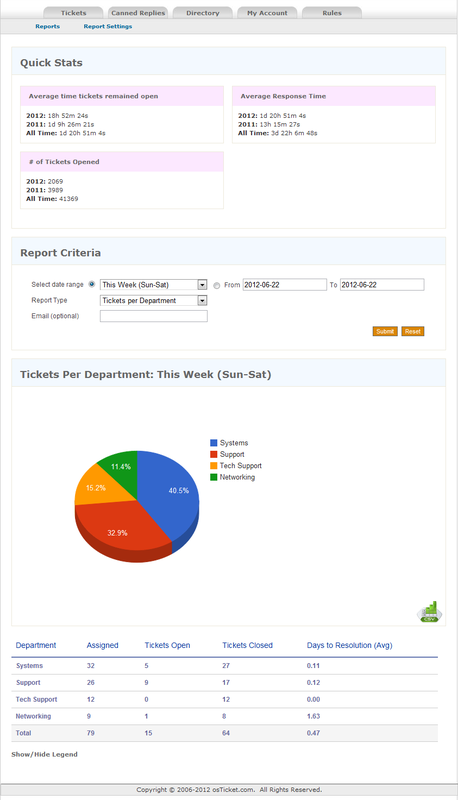 when I try to generate a report, based on tickets by help topic, the tickets created by email are with help topic ‘null’. I want to create a default help topic where tickets created by email will have as their help topic. Any idea ? 1. In header.inc.php, the starting code I have is not quite the same as what is shown in the instructions. I added in the new code, but the result is the page is truncated following the display of the username. 2. In class.ticket.php, I cannot find any line from which to remove staff_id=0. There are no lines with SET status. Thanks for making the MOD available. Thanks for the reply. The MOD isn’t currently compatible with the new code in 1.7. I *just* started working on getting it to work with 1.7 in the last couple of days and I’m experiencing the same issues as you. I hope to have it compatible in by the end of the month so stay tuned. Many thanks for responding. Please let me know if we can help with testing. Do you have any progress? Or anything we can help? I need a database with some actual data already in place. I no longer am at a job that uses osTickets so the only data present would be data I manually enter in. I can not provide you the actual database. But I can help you to test the plugin with actual database. If you need a database to get the reporting going I can help. Let me know where to send it. I need the reporting feature. How is the reporting going? Was the database helpful? Going good other than having someone else install it. They keep running into problems. Hope to have it out before the end of June at the latest. Where can I download GD and FreeType PHP extensions. Hi All, I’ve already found the problem, I’ve noticed that this MOD is already included in the newer version that can export to file, my problem is that is this MOD capable of exporting tickets including the details of the ticket? 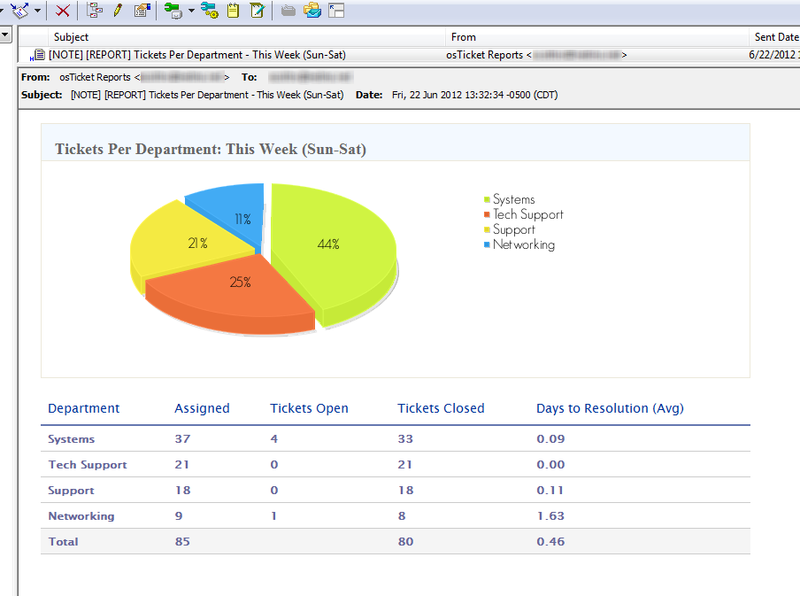 like the logs and the activity or the status of the ticket? I managed to get the reports page open in V1.7, I just replaced $thisuser with $thisstaff and found out that ost_ticket_response is not in v1.7 I see all responses are done in ost_ticket_thread so replaced ost_ticket_response with ost_ticket_thread. I see the default query for report criteria but when I change the criteria and submit the query I get an error as HTTP 400 Bad Request. Any idea on this? ok the error message logged is Invalid CSRF Token __CSRFToken__, any idea on how to solve this? and it stopped giving me an error. Now I will try to actually add some data and see if I get the desired results. Will this work with OSTicket version 1.7? after I place youre code in the header.inc.php file, is the lay-out of my Staff Control Panel web page changed. It seems that the basic structure is gone, tables are spread around the worl page. Hopefully someone could help me with the problem! What version of osTicket are you running? How do I change the pie chart to a line chart? I think this post is quite old already but I am just starting to build osTicket system for our ISP business. I followed your instructions and I think it’s already working now, which I think i very very good for our business. There’s just one thing I notice at the bottom part of the reporting tab. There’s this one issue saying “Can’t open reports_csv/Report_1383128265.csv”. This Report_numberseries.csv always changes. Is there something I missed or I just need to let it run for a day. I just finished everything now though. Many thanks in advance and to your very helpful and very useful MOD. This usually occurs when the file can’t be written into the reports_csv directory. Try setting the permissions on the directory to 775, if that doesn’t work you’ll need to set it to 777. The error disappeared, but no data displaying. Anyone can give me a hint? You should have a error_log floating around somewhere, can you look in that and see what it is now reporting for an error? does this or v 6.0 work for osticket v1.9? Hi, i made these changes to my os ticket install and when you go to the main page it says unknown database. Now im am using mysql for the database on a ubuntu 12 machine. I replaced the header.inc.php with a back up and i was back in business. Any ideas on what would cause this? i dont see others with the same issue? Hi there. Thank you very much for your work. Can you give me a hand to install it? I am using osTicket v1.6 ST. My database is called osTicket. What should I put in “CREATE TABLE” ?? What would have to backup in case I break something ?? PS: Sorry I did not explain very well, but I do not know much English. Sorry for the delay in responding to you. Were you able to get this resolved? The CREATE TABLE code can be copied into a mysql command line or phpmyadmin and run to create a new table with the necessary structure. If you want to back up anything beforehand it would be your osticket database.